Whether you are cooking for one or ten, Simply Pho brings healthy homemade pho noodle soup and all the fixings straight to your table. You'll learn how to put together the perfect bowl of piping hot pho--bothauthentic and quicker weeknight versions--in a myriad of ways! 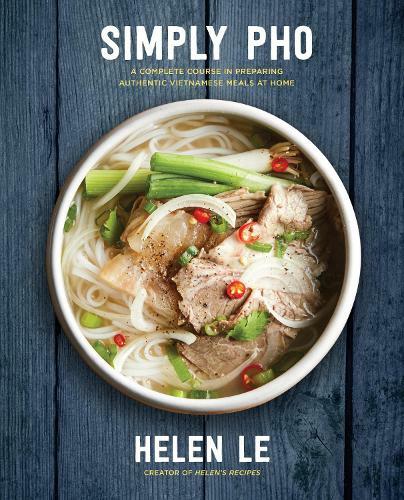 Helen also shows you how to make fresh pho noodles from scratch, Vietnamese baguettes, dipping sauces, flavored oils, and broth and aromatics so you can craft the perfect bowl of pho noodle soup at home. Try your hand at: Pho Noodle Soup with ChickenPho Noodle Soup with Beef StewVegan Crispy Spring RollsChicken Curry with Vermicelli NoodlesMeatball Sandwiches and MoreWith easy-to-follow step-by-step instructions and stunning photos, Simply Pho will bring the mouthwatering and aromatic scents of your favorite Vietnamese restaurant straight to your kitchen!